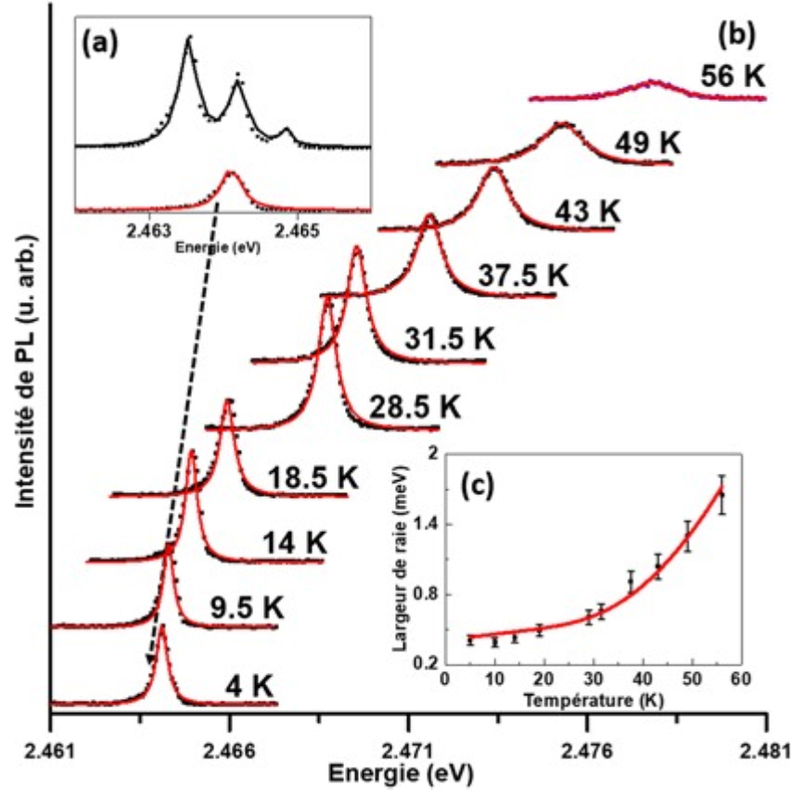 Since their first synthesis in 2015 by Kovalenko’s group at ETH Zürich, the all-inorganic lead halide perovskite nanocrystals CsPbX3 (X = Br, Cl, I) have attracted great attention due to their outstanding electronic and optical properties, as well as their performances which outclass the ones of II-VI semiconductor counterparts in many application fields (single photon emitters, LED, bio-imaging …). 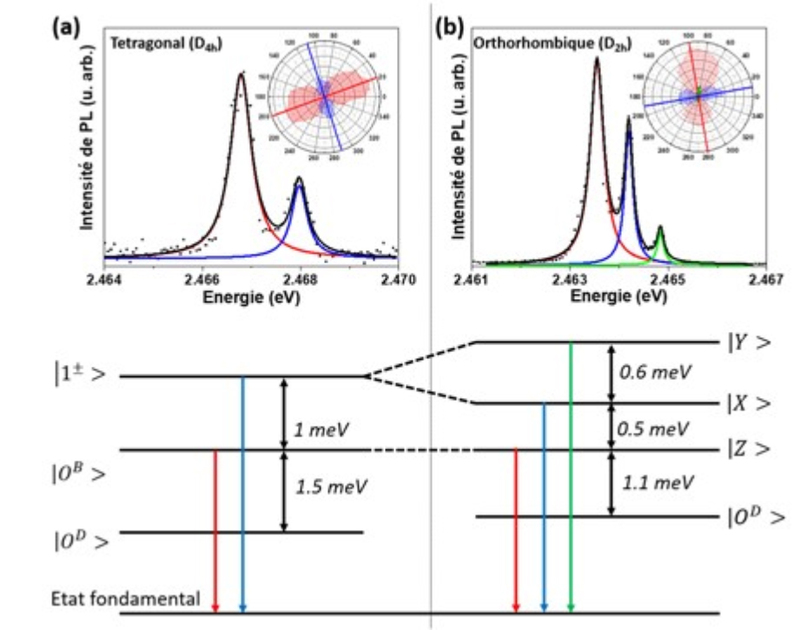 The members of Phocos group, in collaboration with the team Physurf of INSP and Quantum Optics Group at LKB, have focused their efforts on the emission properties at the single object scale in CSPbBr3. Supported by substantial theoretical developments, our experimental results evidence (i) the correlation between the excitonic fine structure (number of emission components, polarization states) and the crystalline structure of a single nanocrystal, (ii) the essential role played by the electron-hole exchange coupling on the splitting of the excitonic energies, and (iii) the mechanisms of the exciton-phonon interaction and their influence on emission. Our studies are very useful in nanophotonics as far as the optimization of coupling of such emitters to nanofibers and fibered nanocavities is concerned. The emissions of single CsPbBr3 nanocrystals are probed thanks to a high spectral and spatial resolutions set-up (microluminescence ). The observed emissions are due to the recombination of excitons which are electron-hole pairs bound by Coulomb interaction. Figure 1 shows the two types of emission we have observed, which appear linearly polarized. The details of the two emissions (compositions, polarizations) reflects directly the degree of symmetry of the crystalline structures : tetragonal phase for doublets (figure 1a) and orthorhombic for the triplets (figure 1b). We have analyzed our results in the framework of a model taking into account the spin-orbit coupling for the conduction band electrons, the crystal field terms, the Coulomb interaction between the electron and hole of the excitons, and the electron-hole exchange energy. 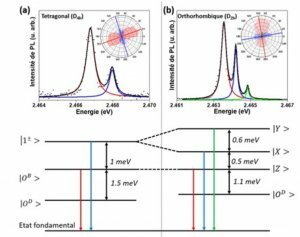 In a first step, absorption measurements in bulk-like nanocrystals ensembles allowed to determine the spin-orbit coupling constant of the lead p-electrons, responsible for the conduction band features, and the crystal field terms in the tetragonal phase. Then the fine structures of the band-edge excitons have been evidenced in the two crystalline phases under focus. Using a development in perturbations, we have adapted to the orthorhombic case a model initially developed for the tetragonal one. In our theoretical development, the perturbation is the additional crystal field term relatively to the case of tetragonal phase. We have deduced the electron-hole exchange energies in the two crystalline phases. The measured exchange energies are about three times greater than in bulk : this due to the confinement of the excitons in the nanocrystals whose size is lower than the exciton Bohr diameter. In the frame of the model, we can place an optically forbidden state, a dark state, below the first emissive or bright state in each crystalline structure (figure 1). This hierarchy in energy for bright and dark states which we evidenced is of great importance because it will govern the luminescence dynamics when the three, or four, excitonic states are thermally mixed. Microluminescence of two individual nanocrystals at 5 K. (a) Typical doublet and (b) triplet. Experimental data are fitted with single Lorentzian functions. The components of the fine structure are linearly polarized (see the polar diagrams). The two schemes represent the energy levels in the fine structure of the band-edge excitons for tetragonal and orthorhombic CsPbBr3, as evidenced in this work. 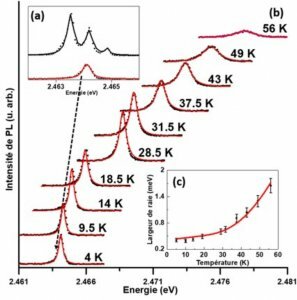 We have also studied the impact of temperature on the emission and followed, to that end, the homogeneous broadening with temperature of selectively detected polarized lines among the components of the fine structure in single nanocrystals (figures 2a et 2b). Modelization of the broadening (figure 2b) allowed to reveal the strength of the couplings of excitons to optical phonons (Fröhlich coupling) and acoustic phonons for temperatures above and below about 30 K respectively. The deduced coherence time of excitons at low temperature is estimated to a few ps ; it is not limited by life time of the order of 100 ps, but by the electrostatic environment and coupling to phonons. (a) Microluminescence spectrum at 5 K of the triplet which contains the line followed in temperature in part (b) without (upper spectrum) and with (lower spectrum) an analyser oriented along the middle-peak polarization axis ; (b) Evolution of the selected line with temperature. Experimental data (black dots) were fitted with a Lorentzian profile. (c) Evolution of the linewidth with temperature. In conclusions, our works help elucidate microscopic electronic properties of our outstanding nanocrystals ; they precise the characteristics of the lowest energies band-edge exciton states in these confined systems, as well as the effects and the nature of coupling to phonons. Thanks to the correlation between observations in electronic and luminescence microscopies, our work paves the way for advanced studies at the single object scale on the influence of confinement, shape, dielectric environment on electronic structure and excitonic emission properties, which are essential features in fields like nanophotonics.